Reading and share top 3 famous quotes and sayings about Plans Changing by famous authors and people. Browse top 3 famous quotes and sayings about Plans Changing by most favorite authors. 1. "... but where do we go? 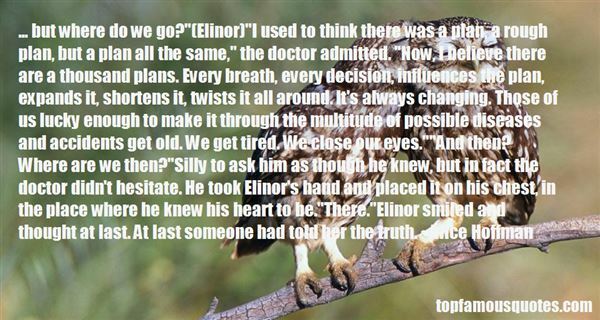 "(Elinor)"I used to think there was a plan, a rough plan, but a plan all the same," the doctor admitted. "Now, I believe there are a thousand plans. Every breath, every decision, influences the plan, expands it, shortens it, twists it all around. It's always changing. Those of us lucky enough to make it through the multitude of possible diseases and accidents get old. We get tired. We close our eyes. ""And then? Where are we then? "Silly to ask him as though he knew, but in fact the doctor didn't hesitate. He took Elinor's hand and placed it on his chest, in the place where he knew his heart to be."There. "Elinor smiled and thought at last. At last someone had told her the truth." 2. 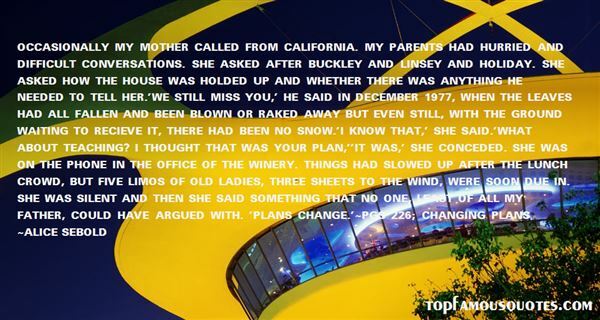 "Occasionally my mother called from California. My parents had hurried and difficult conversations. She asked after Buckley and Linsey and Holiday. She asked how the house was holded up and whether there was anything he needed to tell her. 'We still miss you,' he said in December 1977, when the leaves had all fallen and been blown or raked away but even still, with the ground waiting to recieve it, there had been no snow. 'I know that,' she said. 'What about teaching? I thought that was your plan,''It was,' she conceded. She was on the phone in the office of the winery. Things had slowed up after the lunch crowd, but five limos of old ladies, three sheets to the wind, were soon due in. She was silent and then she said something that no one, least of all my father, could have argued with. 'Plans change. '~pgs 226; Changing plans"
3. 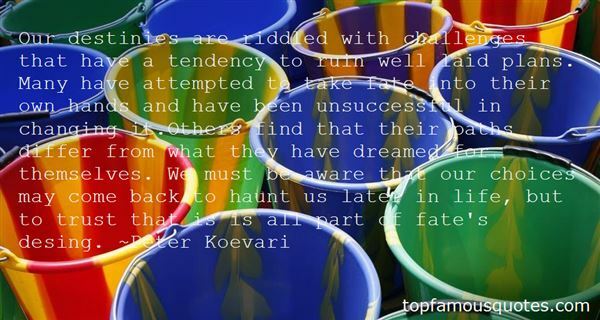 "Our destinies are riddled with challenges that have a tendency to ruin well laid plans. Many have attempted to take fate into their own hands and have been unsuccessful in changing it.Others find that their paths differ from what they have dreamed for themselves. We must be aware that our choices may come back to haunt us later in life, but to trust that is is all part of fate's desing." A veces, el tiempo cambia las cosas como por arte de magia."